Babich, H., Segall, M.A. and Fox, K.D. (1997). The Allium Test–A Simple, Eukaryote Geneotoxicity Assay. The American Biology Teacher. 59, 580-583. Obtain onion bulb, four toothpicks, small beaker (150mL), and enough water to fill the beaker to top. Hold the onion by the top, insert four toothpicks at perpendicular angles to suspend onion into the water. Wait two or three days for root tips to grow. 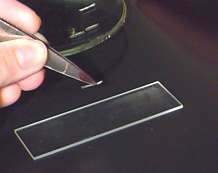 Obtain test tube, pair of scissors, watch glass, and fixative (9 parts 45% acetic acid and 1 part HCL). Cut off four root tips, each approximately 1 cm long; Fill test tube 3cm full of fixative. Place four root tips into the test tube of fixative and incubate at 50 degrees Celsius for six minutes. Then dump heated fixative and tips into watch glass. Take root tips, one at a time, out of watch glass and place each on in the middle of a microscope slide. Cut all excess from the root tips except for 2mm at the very tip of the root (end that was not cut from the plant). 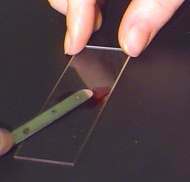 Place two drops of aceto-orcein stain on top of the 2mm root tip. Let stain soak into root tip for two minutes. 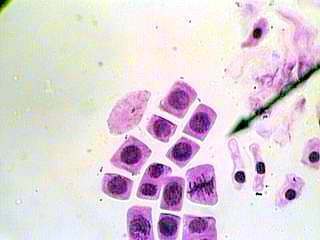 Squash the root tip, on each slide, pressing straight down so as not to overlap the cells. Place two more drops of stain upon the root tip and wait for another two minutes. Then place cover slip flat upon the root tip, making certain not to move the cover slip horizontally. Press the cover slip gently with a pencil eraser, again only straight down without moving the cover slip. Soak up extra stain from slide around cover slip with a paper towel without moving cover slip. I used this procedure on onion root tips and garlic root tips as well. The one thing I found – the root tips are only in the various stages of mitosis at certain times of the day. I seem to recall that onions were around 11:30 CST. Next Next post: Challenge: Have You Seen This Wasp?